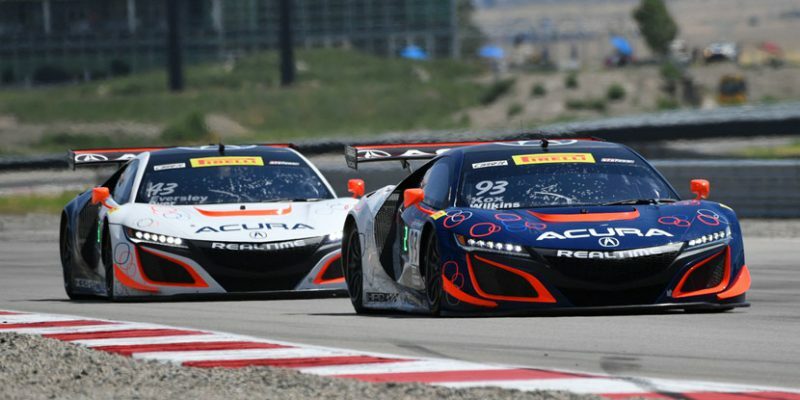 TOOELE, Utah – The RealTime Racing Acura NSX GT3 team had the weekend it had been waiting for at Utah Motorsports Campus, scoring three top-five finishes and taking the new NSX supercar to Victory Lane for the first time in Pirelli World Challenge competition. 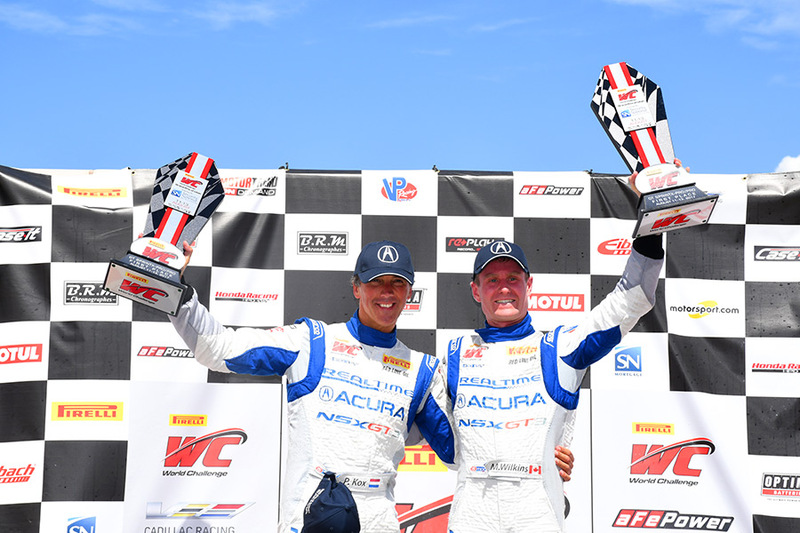 Saturday’s win was the 79th for Acura and RealTime Racing in PWC competition, but the first for the duo of Peter Kox and Mark Wilkins, as well as the first PWC win for the new NSX GT3. But Saturday was only Round 7 of the SprintX championship, and the 14th overall in the GT season, so the party hats had to be put away for Sunday’s eighth round of the SprintX format that features two drivers per car and a mid-race driver change in a 60-minute event. 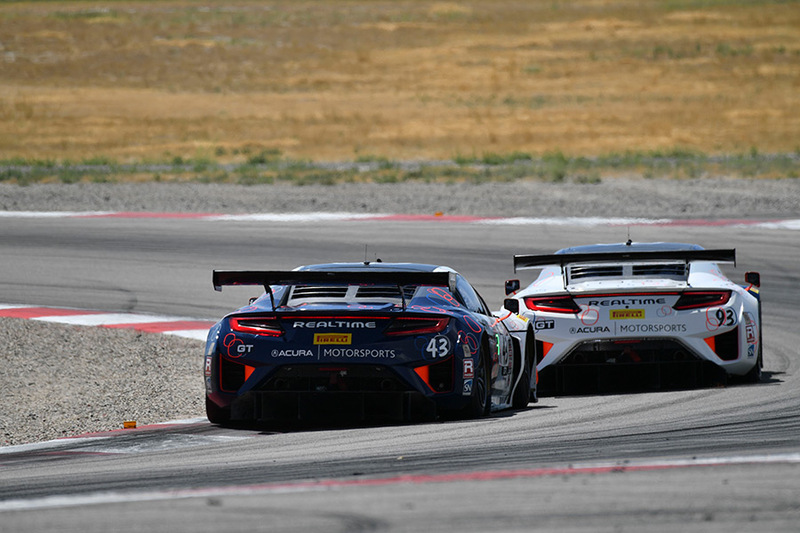 The Acura NSX GT3s and Honda Performance Development didn’t succumb to any post-win hangovers Sunday. 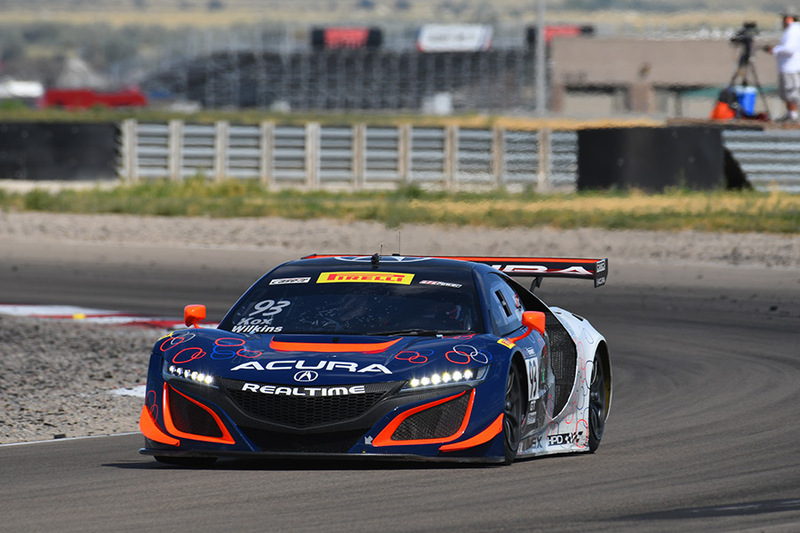 Although Kox and Wilkins fell victim to a cut tire and resulting unscheduled pit stop, Ryan Eversley and Tom Dyer came home with a second-place finish to post a season-best result for their #43 RealTime NSX. Wilkins started second on Sunday, while Dyer chased him into the first turn after starting third. Both Acuras were hot on the heels of the pole sitting Ferrari of Daniel Mancinelli and Nicollo Schrio, but both Acura drivers realized very quickly that something was amiss in the #93. Dyer immediately assessed the situation from the cockpit of the #43 and slipped into second to begin what was a race-long pursuit of the Ferrari. The race never really developed a rhythm as multiple yellows kept the field bunched up through the entire 60 minutes. 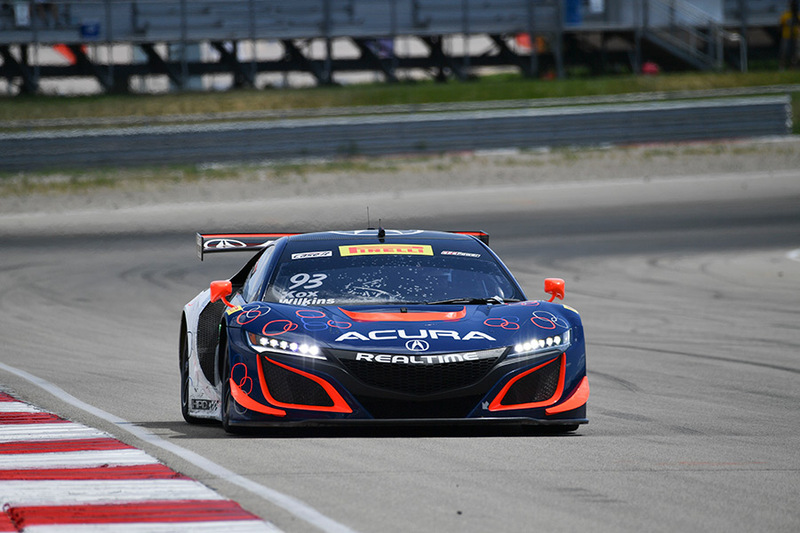 Dyer was able to maintain his second-place spot before handing the Acura NSX GT3 to Eversley, who had a hand in of one of the final cautions during an incident with Patrick Long, before settling for a season-best second place result. 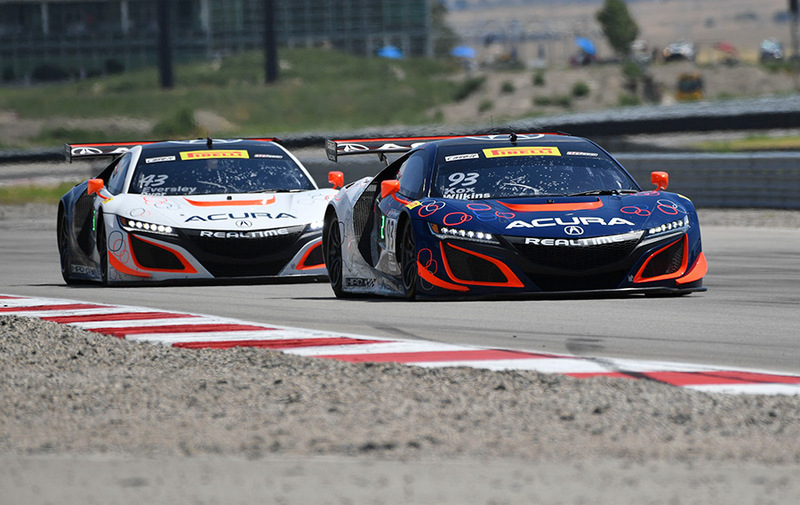 “All-in-all, it was a fantastic weekend for the Acura NSX GT3,” said NSX GT3 Project Leader Lee Niffenegger of Honda Performance Development. “Though we are disappointed with the puncture that put the #93 car out of contention [on Sunday], Tom [Dyer] and Ryan [Eversley] picked up the torch and came home second. Ryan had a go after the late restart and nearly stole away the win from the Ferrari that led the entire race. “We are quite happy with the level of performance we are seeing now, as we head into the home stretch of the World Challenge season, and look forward to working with customers for the NSX GT3 in 2018. Obviously, the timing couldn’t be better to show the car is competitive for both sprint and endurance races,” Niffenegger added. The PWC weekend in Utah also yielded a big victory for the Honda Civic Si of Shea Holbrook, who won from pole in Round 7 of the Touring Car A championship. Holbrook was running her first race of the year in TCA, and outran Elivan Goulant’s Mazda to the finish line by 1.877 seconds to take the win. 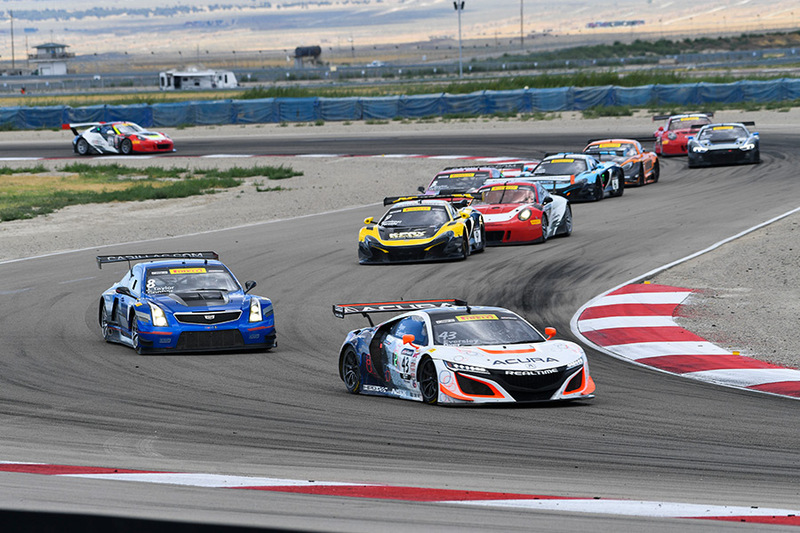 Video recaps from this weekend’s Acura Pirelli World Challenge racing activities at Utah are being posted on the “Honda Racing/HPD” YouTube channel. Produced by the Carolinas Production Group, the video packages can be found in the 2017 HPD Trackside Video Playlist at: https://www.youtube.com/HondaRacingHPDTV.